Canadian researchers have identified what appears to be the first domestically acquired case of an NDM-1 superbug. A case of NDM-1 superbug that was acquired in Ontario highlights how difficult it is to detect and control the infection, Canadian researchers say. The 86-year-old man had not travelled outside of southwestern Ontario for 10 years before he was admitted to a hospital and then a rehabilitation centre in Toronto for a stroke. 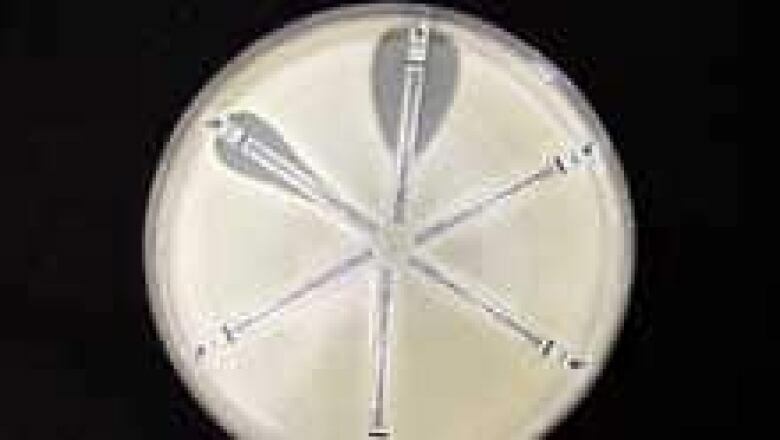 Investigators found he was carrying a strain of bacteria that are able to make an enzyme called NDM-1 that showed deepening resistance to antibiotics. No one knows how the man became colonized with the strain. A second patient, a 71-year-old woman, acquired the resistant bug after she travelled to India for an experimental vein-opening procedure to treat symptoms of multiple sclerosis. "These two scenarios show that local acquisition of an organism producing NDM-1 has already occurred in Ontario," Dr. Susan Poutanen of Mount Sinai Hospital and University Health Network in Toronto and her co-authors said in Monday's issue of the Canadian Medical Association Journal. "To the best of our knowledge, this is the first reported instance in which an NDM-1-producing organism was locally acquired in Canada." When patients are infected with NDM-1, hospitals need to take "extensive" intensive control precautions, such as putting the person in isolation in a single room and boosting cleanup, the authors said. In both cases, the pathogen was difficult for laboratory technicians to detect. Neither patient actually needed to be treated for the resistant microbe because they showed no symptoms. The NDM-1 strain was detected in their urine using molecular tests. Poutanen said the man did not spread the organism to other patients at the hospital or rehab centre and there is no cause for public concern. "The message we want to get out is that this is not a threat to the community, this is not threat to the individual," said Poutanen. "The only reason we wanted to get this message out in terms of publishing it was really to serve as a reminder to laboratories to make sure that they have the methods to detect these organisms and to make sure that hospitals have their infection control practices up to date and reflective of what minimally the Public Health Agency of Canada recommends." The bacteria — Morganelle morganii, a cause of urinary tract and other infections — did not make the patient sick, but his intestinal system has remained colonized with the superbug and close family members are being regularly screened in case of possible transmission. It is not mandatory to report cases of NDM-1 to the Public Health Agency of Canada or PHAC, noted study co-author Dr. Andrew Simor of Sunnybrook Hospital in Toronto. "From various sources the information we have, we work very closely with provincial and territorial laboratories and so on, we are aware of 28 cases in Canada to date having been identified," said Dr. Howard Njoo of PHAC. It is up to hospitals to ensure proper infection control, Njoo said. NDM-1 has mainly been found in E. coli and Klebsiella bacteria, which are common causes of urinary tract infections and pneumonia. For privacy reasons, the hospital and rehab centre where the man was treated for his stroke are not being disclosed. There is no reason to suggest that people restrict their travel in South Asia, where the microbe first occurred, Simor said. Fjola Davidson of Pinawa, Man., about 100 kilometres northeast of Winnipeg, recently went to India and spent 10 days in hospital for vein-opening treatment for multiple sclerosis. She has no regrets. "The hospital we were in was absolutely wonderful," Davidson recalled. "It was so clean and they were so good to us and I'm sure I certainly didn't contact any superbug or any bug." Davidson pointed out that Canadians don't have to go overseas to be exposed to resistant bugs. Davidson said she is feeling better and walking better following the treatment, but not as well as she'd like.